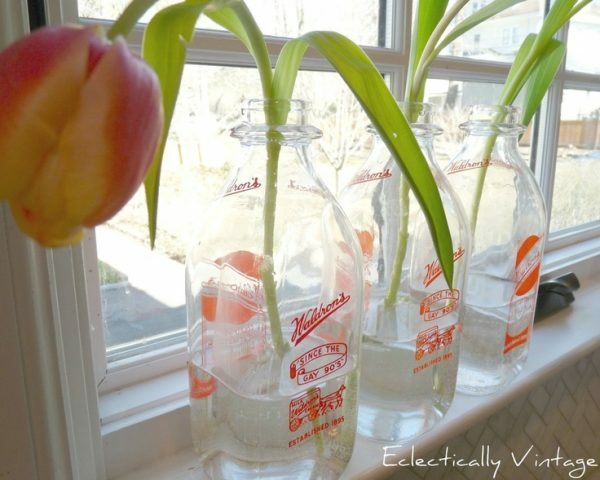 How to Clean Glass Bottles and Vases so they Sparkle! You know I have a thing for old glass bottles and vases. My demijohns, old soda bottles and thrift shop green glass didn’t look like this when I got them. The bottles were filled with mud and crud and dirt and debris (one even hid the stiff little body of a poor little mouse). The vases had mineral deposits and hard water marks. I have been getting tons of comments and emails asking how to clean glass bottles. b) do the same thing but instead of rice, use sand – raid your kids sandbox or buy a bag at the home improvement store. The key is swirling like a madman (or woman) to get off all that caked on gunk. 3) Can’t reach inside the bottle? Drop a couple of Alka Seltzer tabs into a bottle of hot water. Use a long handled brush to scrub. 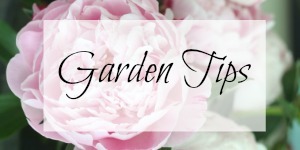 4) For those stubborn mineral deposits – make a paste from a little salt and white vinegar. Rub it on the stains and let sit for a few minutes then wipe off and rinse. Now hurry to the thrift store before all the filthy bottles and vases disappear! Will be thinking of you as that horrible Juno comes your way…stay warm and stay safe…Will be thinking of you! 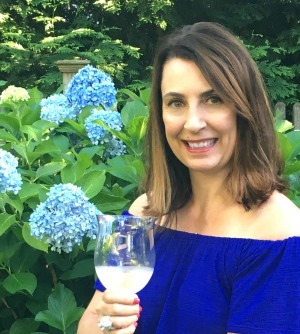 Awesome tips, Kelly! So ready to get outside junking once this horrid winter is over!!! ooh thank you! i needed these tips! Good tips! I’ll definitely try these. I’ve used denture tablets for my bud vases. My kids use these for their retainers so I had them on hand. I just broke them up and dropped them in water in the vase and let them soak. Now maybe i can get some of my bottles really looking good. Thanks so much Kelly you are the greatest. Thanks for the tip. I have a few that need some cleaning. I’m pinning this tip! Thanks Kelly! Swirling BBs work too and you can use them over and over again. I recently saved some vintage bottles from the trash and your tips will definitely help me to make them look beautiful again! Thank you! Great tips! 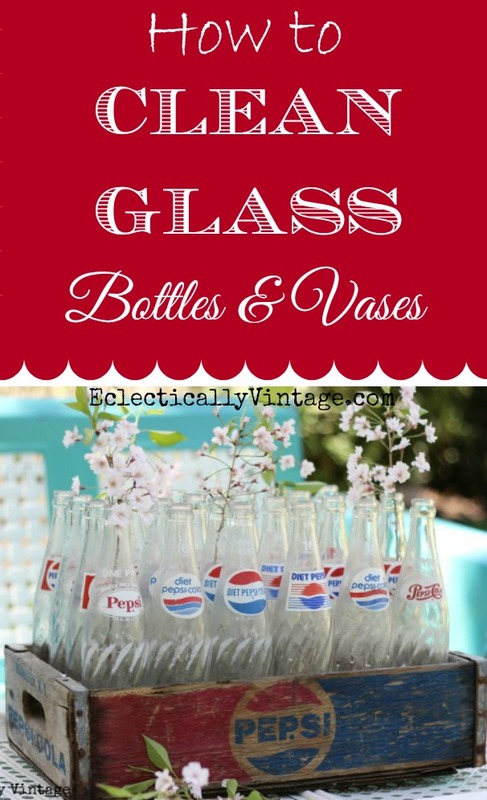 Last year, I purchased lots of vintage bottles to use on the tables at my daughter’s wedding. They soaked in a tub of hot water with Oxy-Clean overnight and I found this to make them sparkle! Great tips! My dad used sand or the mini aquarium gravel for his wine bottles and demigans which I forgot about . Rice never thought about that and Alka Seltzer and Salt paste. I have now a project and get to my collection of 80 bottles that I’ve put away in my “deal with it” later area. I’m just found your blog too. You got me hooked. 80 bottles?! Now that’s a collection Carina! Yep! not sure the hubby feels the same way…until I pull out the 100 year old beer and seltzer bottle lol! and I shared this tip on my Facebook page too.